Take Exit 27A on I-95 or Exit 49N on the Merritt Parkway, the connector "RT. 25" North towards Danbury. At the end of the connector there is a traffic light at the intersection of Rt.25 and Rt. 111. Continue through the intersection on Rt. 25 for another 1.6 miles (also known as Main Street or Old Newtown Tpk.) to the next traffic light, just past the Dutchess Restaurant on our right. Take a right turn at this traffic light on Purdy Hill Rd (see below*). From Rt. 84 take Exits 8,9, or 10 on to Rt. 25 South past the Sand Hill Shopping Center (Stop & Shop in Newtown), and continue past the Clock Tower Square Shopping Center (this is the intersection of Rt. 59). If you are on Rt. 59 heading east, you now make a right turn heading South on Rt. 25. Travel another 1.4 miles South to the intersection of Judd Road on your right and Purdy Hill Road on your left (Miner's Funeral Home is on your right). Make a left here on to Purdy Hill Road. (see below *). If you go past this intersection and see Dutchess Restaurant on your left, you have gone too far. *After turning on to Purdy Hill Rd. and traveling .2 of a mile, the road will split to a "Y"; bear right and continue on Purdy Hill Road. Travel another .4 of a mile to Doc Silverstone Rd. on your left, this is the entrance to the Great Hollow Lake (just past the Benedict Agway). Continue through the entrance, and the fields will be on the hill to the left of the parking lot and the lake / pavilion & rest rooms. Take Exit 11 for Rt. 34 South towards Monroe & Derby. Continue South until the intersection of RT. 111 and make a right. Continue approx. 6 miles through blinking yellow caution light and several traffic lights until Purdy Hill Road. The US Post Office will be on your left. Make a right turn and continue 1.5 miles to Doc Silverstone Rd. on your right. The fields are on the hill just opposite the parking lot, lake and pavilion. Wolfe Park is located at the intersection of Cross Hill Rd. and Cutlers Farm Rd. Take the Rt. 25 connector from I 95 north or south at Exit 27A or the Merrit Parkway at Exit 49N towards Danbury. This exits on to Rt. 25. Continue on Rt.25 until the first traffic light is reached which is Rt.111. Make a right turn on Rt.111 towards Monroe and proceed approx. 3 1/2 miles. Take a left at light (about 1/2 mile past Mcdonalds) onto Cross Hill Rd. Go to the end of the road. Take a right then quick left into the park. From Rt. 84 Eastbound, take exit 9, a right turn at the end of the exit ramp, left at the next traffic light and you are on Rt. 25 South. Continue south through Bethel, Netwown and to Monroe. From Rt. 59 go to Rt. 25 south, Rt. 25 south meets Rt. 111 at the traffic light that begins the connector. Take a left on to Rt. 111 and continue as above. 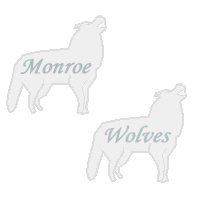 Monroe Elementary School Field is located on Rt. 111 in Monroe (across the street from Champion Indoor Sports Center and diagonally across from the McDonalds Restaurant). Access to the field is directly behind the school building and you enter the parking lot from the left of the school. Directions to Monroe Elementary School are to take the Rt. 25 connector from I 95 north or south at Exit 27A or the Merrit Parkway at Exit 49N towards Danbury. This exits on to Rt. 25. Continue on Rt.25 until the first traffic light is reached which is Rt.111. Make a right turn on Rt.111 towards Monroe and proceed approx. 3 miles, the school is on your left. The Middle School Campus is located at 345-375 Fan Hill Road in Monroe. Follow the directions to Monroe Elementary School, go beyond the elementary school and continue past the McDonalds restaurant to the next traffic light. This is Elm Street. Make a left on Elm Street and continue to its end (2 or 3 miles). Elm Street ends at Fan Hill Road. Continue left on Fan Hill Road, through a stop sign and you will approach an elementary school on your left (Fawn Hollow Elementary School), continue past the elementary school and the driveway and entrance to the Middle School Complex is a left turn directly past the elementary school. Continue to the left side of the first building and the soccer fields are directly behind the building. From Rt. 84 (East or West) take exit 11 and proceed south on Rt.34. Continue several miles until Rt.111. Make a right on to Rt. 111 and proceed through the town (approx. 5 miles until you reach Elm Street). A small Duncan Donut restaurant is on your right. Make a right turn on to Elm and follow directions as above. Masuk High School is located on Rt. 111. From Rt. 95 North or South exit at the Rt. 25 connector at Exit 27A and follow Rt. 25 until it intersects with Rt. 111 (same for Rt. 25 south) follow the directions for Monroe Elementary School. Proceed past the elementary school and continue approx. 5 miles and Masuk HS will be on your right. From Rt. 84 (East or West) take exit 11 and proceed south on Rt.34. Continue several miles until Rt.111. Make a right on to Rt. 111 and continue approx. 2 1/2 miles, Masuk HS. is on your left.